This was also the perfect opportunity to finally upgrade to a 64 bit OS and now that the specter of Vista was behind us, Win7 was looking pretty good. The sheer amount of power you can get these days for $1225.00 boggles my mind - this relatively modest machine replaced a five year old pentium D machine that cost me twice as much to build and was an absolute slug by comparison. ...and I already had a nice 4U rackmount case & PS from my earlier build...though, because it was an older PS, I needed to spend about three bucks on an adapter for secondary power to the video card. The D-400-6 rack cases from IStarUSA are fantastic BTW! The DP55WG is a basic board but with some surprising extras like SPDIF audio, onboard diagnostic LED readout and external bios reset button. I've been building my own PCs for a couple of decades now and have found that pairing an Intel board with an Intel processor and decent cooling makes for a very stable system, even in this case with the quad-core CPU clocked to 3.6 GHz. Been using this machine for about a month now and, so far, it tears through every app I've thrown at it. DVD encoding takes minutes instead of hours now. Some of the most demanding photoshop filters take only moments and I'm getting very high frame rates (at 1920 x 1080) for Fallout 3 and TES4! Haven't had a single crash, lockup or bluescreen either - this has been absolutely rock-solid! I give Intel and G.Skill high praise for this. 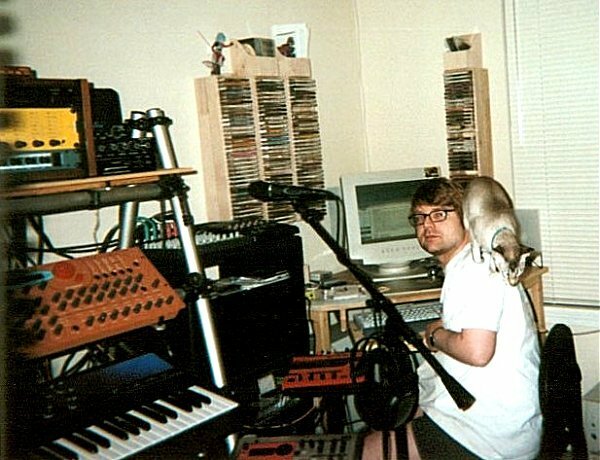 Just for fun, this is me in my studio ten years ago. Tali was one year old. The Waldorf Micro-Q had just been released. It and the Microwave XT were the centerpiece of my studio. I was using a couple of Bose patio speakers for monitors. "Silver Thread" from my forthcoming album was used as a Guinea Pig, trying out the free video software in Win7. It's basically a slideshow of a number of my CG images. To my profound disgust, one of my beloved ADAM P11a monitors died over the weekend. The internal amps were both distorting and crackling horribly, rendering it completely useless. I was so furious at first as this was the last thing I needed while in the midst of mixing the new album. In the end, I suppose I figure I did okay, getting almost seven years out of the ADAMs. I'll most probably get the faulty one repaired if I can find a decent tech in the area without a months-long waiting list but, in the meantime, I desperately needed new monitors. I spent most of Saturday at my local Banjo Shack inflicting an entire CD's worth of my rough mixes on two very patient sales guys. Unfortunately, my budget was only about half of what it was when I got my ADAMs so I had to be extremely thrifty as well as critical. I had almost settled on a pair of KRK VXT 8s but every one of the four units I tested had some weird flaw - a silent tweeter, a fluttery woofer, an intermittent high-pitched whine, etc. It has completely soured me on KRK as a brand. Shame, because the VXT 8s looked to be a perfect fit. My final choice was a bit of a revelation for me. After hours of listening and re-listening, I finally ended up settling on a pair of Yamaha HS80M monitors. I had been prepared not to like these as Yamaha modeled their aesthetics on their famous NS10 grotboxes, white woofers and all. Sound-wise though, they were a welcome surprise with a very flat response and nicely revealing of the subtle flaws in my test mixes. At less than $400 a piece, the price was seriously too good to be true - especially considering the sound quality. Suffice to say, I left with two largish boxes on a hand truck. So far these HS80Ms have been perfectly lovely in the studio, much better than I had hoped in fact! The HS80Ms have a slightly more "forward" or "aggressive" sound than the ADAMs but, so far, haven't been fatiguing, even during long mixing sessions. Working with them has been an absolutely painless transition so far. They're not overbright and the response seems very flat all the way down into the lower bass regions though there is a noticeable rolloff around 50hz or so. I hate to admit it but, in some ways, these are more helpful to me than the ADAMs have been. Placement of instruments in the stereo field seems more accurate and the bass extension seems more detailed, allowing me to fit "bassy" instruments together better with less overlap. The "sweet spot" is a lot wider than what I've grown used to as well. I've had a chance the last few days to remix a number of my tracks and check their translation on other systems and have been getting great results! We'll see how these "budget" monitors hold up but, so far, I'm completely floored by the quality/price ratio on these things. I'm even starting to get used to the ugly white woofers.